Karate is a martial art consisting of punches, kicks, blocks and a small number of throws. It is practiced barefoot, wearing a white suit (gi), with a belt around the waist, denoting the skill level that the student has attained. Karate students (karateka) of all levels practice the basics - kicks, blocks and punches, both singly and in combinations. This basic training improves their execution of technique, builds stamina, and improves their stance. Karateka also practice sequences of movement called kata, which are set pieces of attacks and defences against opponents from all sides. Most of the time these kata are practiced alone, but for displays, the complete kata is sometimes performed with the attackers playing their part. There are pre-determined attacks and defences for pairs of students to master (ippon kumite), and finally there is free-sparring (kumite), where students use their skill and strategy to score points from their opponent. There are several styles of karate, each with slightly different interpretation of kata and basic form. The biggest schools are Wado-Ryu , Shotokan, Goju ryu and Shito ryu. In the Wado-Ryu school, a new student starts with a red belt, then progresses through white, yellow, orange, green, purple, brown and then black. There are 8 'Kyu' grades to be mastered before the student can attain 'Dan' grade status - black belt. The Kyu grades are counted backwards, 8th Kyu being the lowest, and 1st Kyu the highest. From 1st Kyu, brown belt, the successful student progresses to 1st Dan, the first black belt grade. At each promotion examination the student must perform the syllabus for the grade, with a level of skill that matches the grade sought. 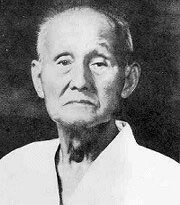 Wado-Ryu karate was founded by Hironori Ohtsuka. Ohtsuka was born in 1892, the son of a doctor of medicine. He was introduced to the martial arts by his uncle, who taught him ju jitsu. When Ohtsuka started school he studied Shindo Yoshin Ryu Jujitsu, an art which emphasised the grace of movement. He brought many of these principles of movement into Wado-Ryu karate, where using the opponent's body weight and movement are just as significant as using your own, in overcoming an attack. Ohtsuka studied commerce at University, and while there experimented with different styles of ju jitsu. In 1917 he joined the Kawasaki bank, and while there met Morihei Ueshiba, the founder of Aikido. Aikido is a defence art that maximises the use of the opponent's own strength and momentum to defeat him. It consists of several very graceful and flowing throws and holds which can be executed from virtually any type of attack. In 1922 at the sports festival in Tokyo, Ohtsuka first saw karate. Gichin Funakoshi Sensei was there to demonstrate Okinawan karate. Ohtsuka was extremely enthusiastic about karate, and Funakoshi agreed to teach him all he knew, and within a year Ohtsuka had learned all the katas that Funakoshi had brought with him. Ohtsuka then practiced kata with Mabuni Sensei, the founder of Shito-Ryu karate. By 1929 Ohtsuka was the chief instructor of Shindo Yoshin Ryu Jujitsu, and assistant instructor at Funakoshi's dojo. Ohtsuka felt that Okinawan karate, which concentrated only on kata, lacked the study of attacking techniques. For this reason he branched out from Funakoshi's style and developed his own style, 'Wado'. Wado-Ryu began officially in May 1934, when Ohtsuka registered it as an independent style. In 1939 the Japanese Martial Arts Federation asked for all the different styles of karate to register, and these included Shotokan Ryu, Goju Ryu, Shito Ryu, and of course Wado-Ryu .